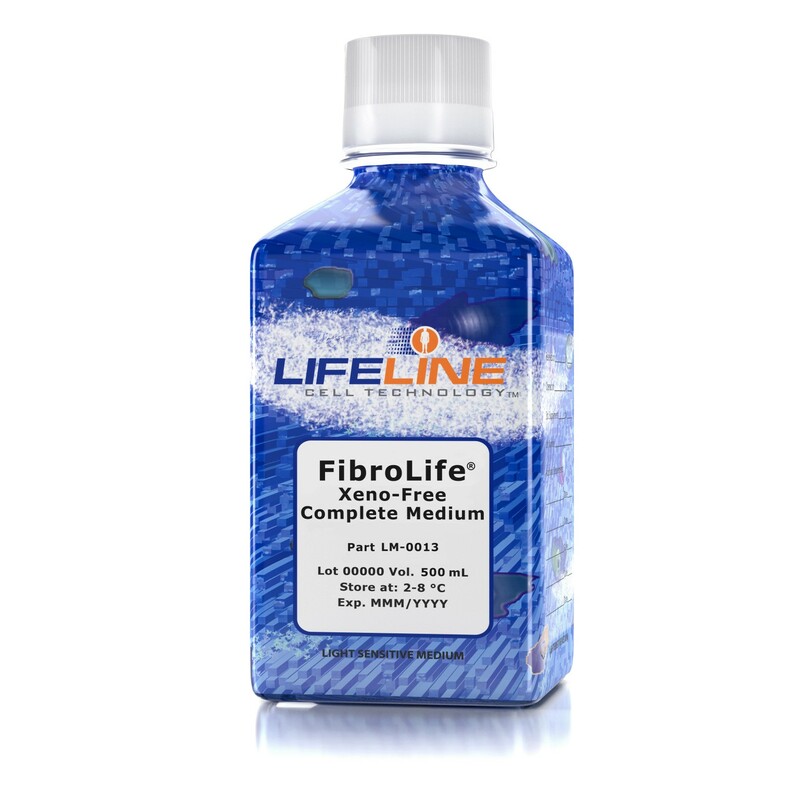 View cart “FibroLife® S2 Fibroblast Medium Complete Kit” has been added to your cart. FibroLife® Xeno-Free Complete Frozen Medium is a variation of our FibroLife® cell culture medium optimized for culture of fibroblasts without the use of animal-derived components. FibroLife® Xeno-Free supports the growth of these cells in a 2% human serum environment at rates equal to or greater than comparable media supplemented with 2% to 10% FBS. FibroLife® Xeno-Free Complete Frozen Medium contains all the necessary growth factors to support fibroblast growth. FibroLife® Xeno-Free contains no antimicrobials and no phenol red. (A vial of Xeno-Free Penicillin/Streptomycin is included in FibroLife® Xeno-Free Medium Complete Kit LL-0048.) Xeno-Free phenol red is not available at this time. FibroLife® Xeno-Free provides an ideal cell system to establish Xeno-Free human feeder layers for stem cell culture or as a model to study wound healing, toxicology or basic cell biology. FibroLife® Xeno-Free Complete Frozen Medium is offered as a fully supplemented frozen medium with extended shelf life of up to 2 years. Xeno-Free trypsinization and freezing reagents are also offered by Lifeline®, to allow you to maintain a Xeno-Free culture environment. FibroLife® Xeno-Free Complete Frozen Medium grows fibroblasts at rates that exceed other commercially-available media containing animal-derived components while maintaining excellent cell morphology. In comparison with FibroLife® S2, which outperforms other commercially-available fibroblast media, FibroLife® Xeno-Free Medium shows superior proliferation at different seeding densities.